2 storey office with plaster walls and suspended ceilings. Self contained with tinted double glazing, heating and kitchenette. Lighting, electrical sockets, carpet as seen. On site allocated parking and general visitor parking. 9b Canberra House is an improved 2-storey office including fully fitted ground and first floor offices. The building is of facing brick construction beneath a pitch roof with on site car parking. Ground floor entrance lobby with stairs to the first floor landing, meter/store cupboard, and disabled size WC with extractor, wash hand basin and water heater. 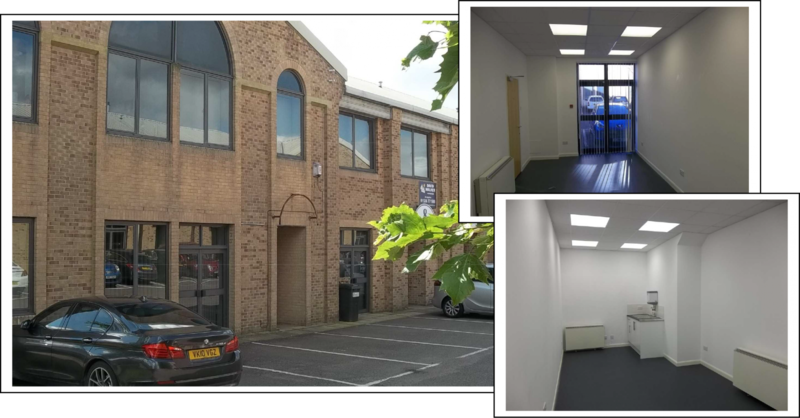 The ground floor office has double door glazed access to the front, and has been improved to an office specification with plaster wall finish, electric heating, suspended ceiling, inset lighting and either a vinyl or carpet floor covering. Kitchenette area with stainless steel sink. The first floor office has double glazed windows to the front, with a decorated plaster wall finish, electric heating, suspended ceiling, inset lighting and carpet. Landing with window to the front. Energy Performance Rating Band E.
The 2010 Rating List gives a Rateable Value of £3,650. The full amount payable in 2014/15 would be £1,719.15, although if this is the ratepayers only commercial property there will be NO RATES PAYABLE until April 2016 due to small business rate relief. The property is available by way of a new standard lease at £4,750 pa plus VAT. The ingoing tenant to be responsible for the reasonable cost (if any) of preparing the lease and counterpart. Copyright 2019 © Corbygate Business Park, Part of Business Park Management. Registered in England. Registered Office: Business Park Management, Prior Haws Road, Corby, Northamptonshire. Company Number: 03847550.